Sketching from photos, experimenting with mixed media and working through ideas for a painting. I've said that I only occasionally work from photos - this is one time that I did. 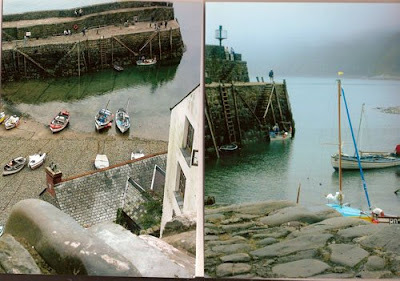 The reason is that I would like to do some paintings of Clovelly and I hate painting directly from photographs. Sketching, simplifying and making colour decisions and then working from the sketch, changing things again, is how I tackle the problem. I'm not a photo realist so I don't want to reproduce the painting. The scanner hasn't picked up all the colours very well, there are blues in the stones of the wall at the front, reflecting the colours of the sea and cool misty blue of the sky. 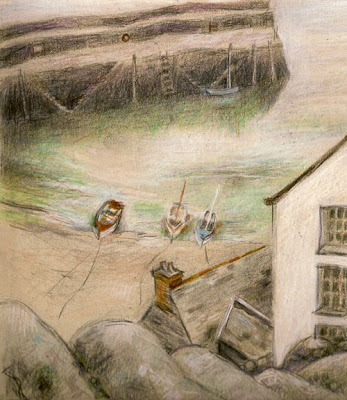 The village is built of rocks from the seafront - huge rocks in the harbour walls and smaller rocks for the walls of the houses and gardens - and to stop you tumbling down the steep cliffside the village is built into. Even the road (too steep and bumpy for a car, so purely for pedestrians) is made of cobblestones taken from the beach. The buildings are distorted and so I had to sort out the perspective. I 'lost' many of the boats and one of projections on the roof, simplifying the composition. I took loads of photos when we were there and we walked all round the village and harbour. The moody misty day was wonderful for photographs and painting even if not good holiday weather :>D I wouldn't have tackled this from someone else's photo - the fact that I had been there and sat looking hard at the scenes means I remember the day - not as well as if I had sketched unfortunately but I do remember it pretty vividly. I played with the charcoal and coloured pencil combination in a sketchbook with rather nice beige paper. It doesn't have a lot of tooth so didn't hold the initial charcoal very well but using coloured pencil over it and fixing it meant it didn't matter. The beige comes through the other colours, warming up what could have been a very cold grey scene. It looks rather like a book illustration at the moment but it has loosened a little from the photo and will loosen up further in the final painting. ............ and still working too many hours :>( and not enough painting time ...... and family at the weekend, which is lovely but still no painting! Ilike your sketch ersion better than the photo - more atmosphere and the house looks better by turning it slightly and showing more. It will make a really nice painting. I know the mixed feeling. I have family this weekend. My grandson sleeps over on a Friday and stays til evening on a Sat. Love having him while he still likes to come but he is growing up fast so I expect it won't be for too much longer. Grabbing as much time as possible today as I won't get much work done this evening and tomorrow. Now I just have to find the time to paint! but i couldnt do better than you do..
thanks Tiffadora :) But I do prefer working from life. You've created a good composition from these photos and the colours are good too. It will make a lovely painting.